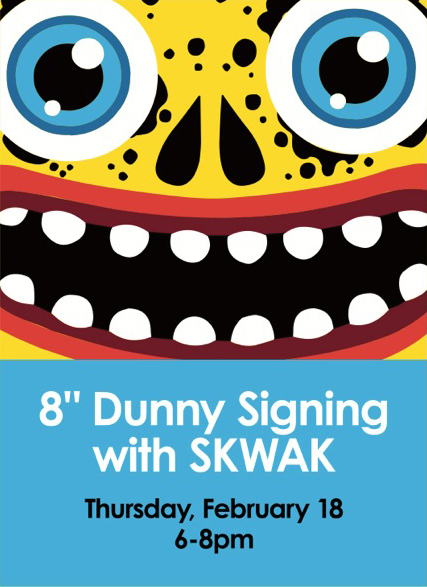 This Thursday, the Kidrobot London store will be hosting another of their popular signing sessions, this time with French artist Skwak, in conjunction with the release of his new 8″ Oil Slick Dunny. Skwak’s work is centered around his own world of creatures based on childhood myths and fairy tales. Crazed characters with bulging eyes and massive grins are often found within his illustrations and the Oil Slick Dunny is no exception. This release comes in two limited colourways with different release locations. The black/clear Dunny will be a web only release while the gold/clear version will be available exclusively from Kidrobot stores around the world. Both release on the 18th of Feb, and will retail for around £65. Word has it that they might just have a few of the web only black/clear colourway instore at Kidrobot London for the signing session, but don’t expect those to be around long. The event kicks off at 6pm – there will be a crowd so expect to queue if you’re not camped out in front early.